Last weekend, we bought a basil plant. I don’t know what we were thinking. The plant spent its first week in its new home being coaxed into an early grave by two seasoned plant killers. I have been reading Michael Pollan’s excellent book on gardening, Second Nature, in which he discusses the green thumb (you got it or you don’t). Those with it just know how much to prune a plant so it will garner optimal nutrients from the soil and sun. Anyway, after pruning all week, we decided we’d better just harvest the poor plant and be done with it. It’s now sitting baldly under a sunny window hoping for better days. So pesto. I haven’t always been a huge fan, mostly because it starts sitting real heavy after a few bites. But I have to say, the fragrance of all those raw, chopped ingredients on the kitchen counter was heavenly. The end result was also heavenly, and didn’t culminate in a pool of oil the way pesto often does. 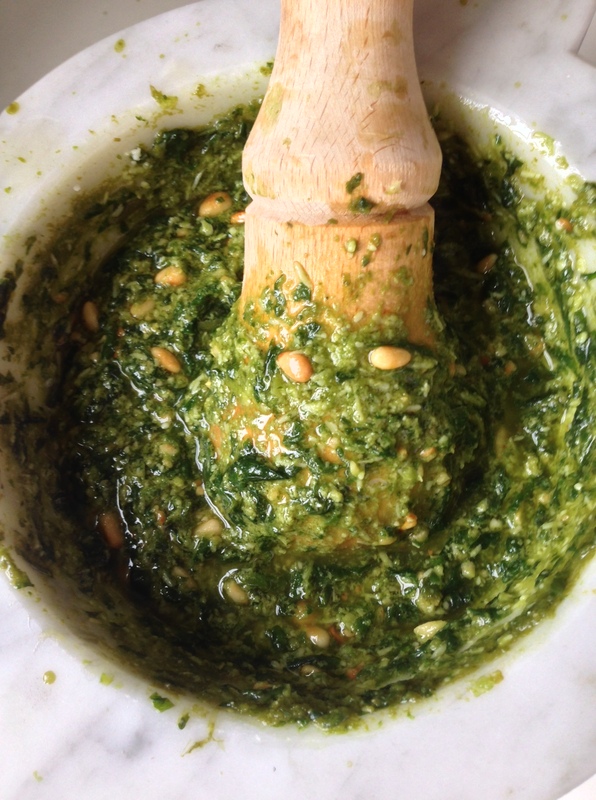 Tons of muscle work later, we had a divine-tasting pesto, about 2 cups worth. We had it over linguine with chicken, garnished with more Pecorino-Romano. A little goes a long way. -Saturday, August 2, 2014: Substituted almonds for pine nuts, and it turned out quite well (and we avoided the dreaded pine mouth). We also added a substantial squeeze of lemon, as some folks think the almonds taste richer than pine nuts. This entry was posted in Italian, Main Dish, Pasta, Recipes and tagged basil, michael pollan, pasta, pesto. Bookmark the permalink.